Our grass on the RTE News! 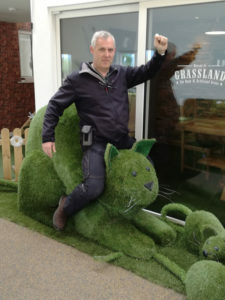 Hi Mark, here we are in Grassland in Naas, your synthetic grass HQ. Dotted around the grounds are lots of different props, art pieces and animals(fake!) 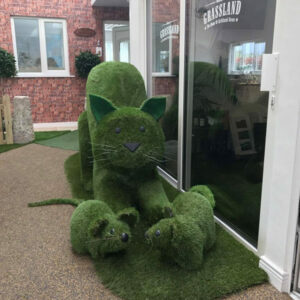 covered in fake grass, what’s going on? Anything that stays here long enough we cover it in grass. C’mon Mark! This is not horseplay! So you do these for people and they only borrow them? Yeah exactly, they rent them. 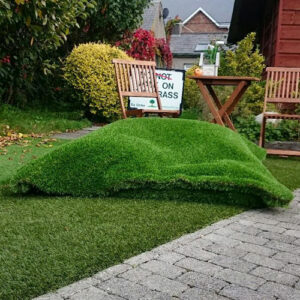 As an artificial grass company we’ve had demand over the years for once off rentals, not everybody wants to buy the grass outright, they might only need it for a couple of hours. Today we got an order for 8 square meters of artificial grass from a high-profile photography company, for a photo shoot. We sent them on a few pictures of the fake grass with some shoes on it so they could look at the pile height. And they’ll be returning that next Monday. So instead of buying, they rent our grass for half price. Recently I began to think it was time to formalise our rental offerings. Rentals are a slightly different animal to sales, we’ve certain terms and conditions regarding the grasses use. Naturally sometimes we might decline if we feel that things might get a little bit crazy, cigarette butts, damage that sort of thing. What other rentals do you do? Anything really; corporate events, corporate parties, weddings. More and more TV companies want us to help build a set, event management companies ask us for help with a promotional event they are running. Film studios call us up about a specific grass situation we can help out with. Sanctuary Synthetics has been in business in Ireland a long time. We’ve done several award-winning Bloom gardens and created our own props as well, many are on display here in Grassland in Naas. Exhibiting over the last eleven years in Bloom, has generated a lot of admirers and enquiries for our pieces. We thought why not make them more available for the public. Almost any item, set, or prop can be made to order. Already we have 30 odd products, at different prices, in varying conditions, some of them are more delicate than others, for people’s parties, weddings, lavish corporate events. 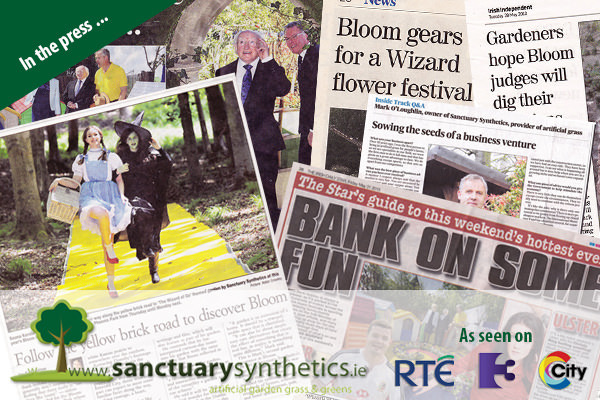 Sanctuary Synthetics work with a lot of the top event management companies in Ireland, they’ll ask us for a particular build and we’ll take it from there. Event management companies who work for the Googles and the Facebooks and all sorts of different clients in the corporate world. Dublin corporation is another good client we enjoy working with. Companies who have a new product launch, new show rooms, new premises they want something special for them. The piece might be a nice novelty, or more often help sell a concept, explain an idea. Visuals are still king when it comes to communicating an emotion or an idea. What is the weirdest one you have done? Not so much weird, but only a few months ago there was a launch for the women’s mini marathon. The Irish presenter of Strictly Come Dancing was on a floating platform on the Liffey on our artificial grass, a black road down the middle with white lines and grass verges. I’m a sucker for getting our grass out in front of the public and as we didn’t have a garden in Bloom this year we exhibited instead. I decided to pack up the giant green bunny and head up to Phoenix Park, maybe get some pre-publicity. Low and behold page two of the Irish Independent, our giant rabbit with two little girls either side, it captured the imagination of their photo editors. And we all had a smile on our face that week. Meet some of the grass pet family! You enjoy the creative side? We all do. For example with Coca Cola, they designed, and we built a green hairy golf buggy float for the parade, with a big Coca Cola logo for their Coke Life launch. We also supplied the synthetic hedging for a project in Pearse Street train station, another green themed promotion. Even more recently we covered giant RTE timber letters with grass, very satisfactory. We take these as an endorsement of our work. We’re the best at what we do in Ireland and we like to prove that when we can. You personally still get a kick out of it? Yes. There is a nice simple satisfaction in doing people’s gardens, whether urban, rural or suburban. That is the foundation of our business sure, but I think we all get a different sense of satisfaction, pride maybe, from the more unusual requests. Variety is the spice of life and synthetic grass is a very versatile medium to work with. We work with an artist over in Bristol, very highly skilled, she helps with the more artistic ventures. Sanctuary Synthetics also work with a model maker, the guy who made Rodge and Podge. 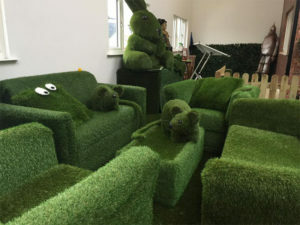 He likes to make animals and humans covered in artificial grass. A current example would be Mr and Mrs Grassland. Naturally we are now looking at finishing off the family with introducing a couple of children. We did a cool giant chess board, draughts board, that I really liked, somebody bought that off us, but I still kind of miss it. Our waterproof beanbags are a hit! Recently we’ve been doing some work with Ardmore Studios, the makers of Penny Dreadful. 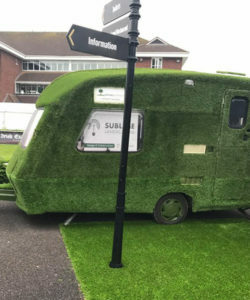 TV studio and Film Studio work is something we have always done, but now we are going to have a dedicated space on the website, most of our fake grass pieces are available to view here in Grassland and all of them are on the website. None of this is necessarily new, but we have decided to give grass rentals its own space now. We are the artificial grass people, so whatever movie prop, or TV set, giant this or that, you’d like, we can do it for you. We like covering things in grass, it’s what we do! So what can you hire/rent? 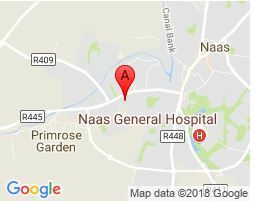 You can rent our artificial grass (3 pile heights – 40/25/20mm) from as little as €8 per day (per sq mtr). Note – Hire prices per day. Weekend and long term rates available on request. Terms & conditions apply. We have Various Garden Art Sculptures from Award Winning Bloom Gardens, prices starting from €120 per day.